Definition: an origin, creation, or beginning. From demons, weres, and vampires, to dragons, shifters, and angels, GENESIS is the ultimate must-have boxed set for any urban fantasy & paranormal romance fan. GENESIS brings you eight new worlds to sink your teeth into. From some of the genre’s brightest talent, each title in this boxed set is the first installment of the authors’ respective series. 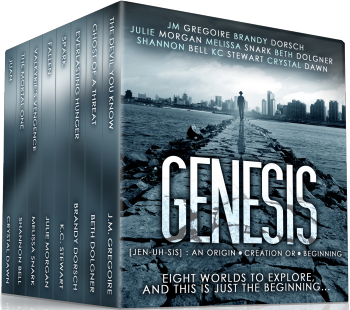 Dig in your claws and hang on as these eight authors take you on a wild ride in GENESIS! Previous postNever Be Afraid To Let Your Geek Flag Fly! Next postSweet mother of hell, I had a lot more to say than I had planned.